I went into all the detail of what I was up to yesterday, so I’ll just go into what today’s project was. Cutting the pig into smaller, useable cuts. And by the way, my arms are really tired tonight! I did this piece last because it was the trickiest. The scapula is a very weird shaped bone and hard to cut around. There are also ribs and spine in this piece and the whole front leg. I couldn’t understand why the video said to use this piece for sausage because it was such a lot of meat. Now I understand. It is not pretty when cut up. you can’t make a nice steak or anything out of it. It’s just a bunch of meat. With lots of layers in between. Good meat, but not pretty. Put it in sausage! I do love sausage so it is just fine there. I pretty much took the skin off, which is a pain but I’m getting the hang of it, and put it in a brine for ham. The piece on the right I deboned and put for sausage. The piece on the left I deboned and cut some small steaks which I will can. The piece in the middle I made pork chops out of. 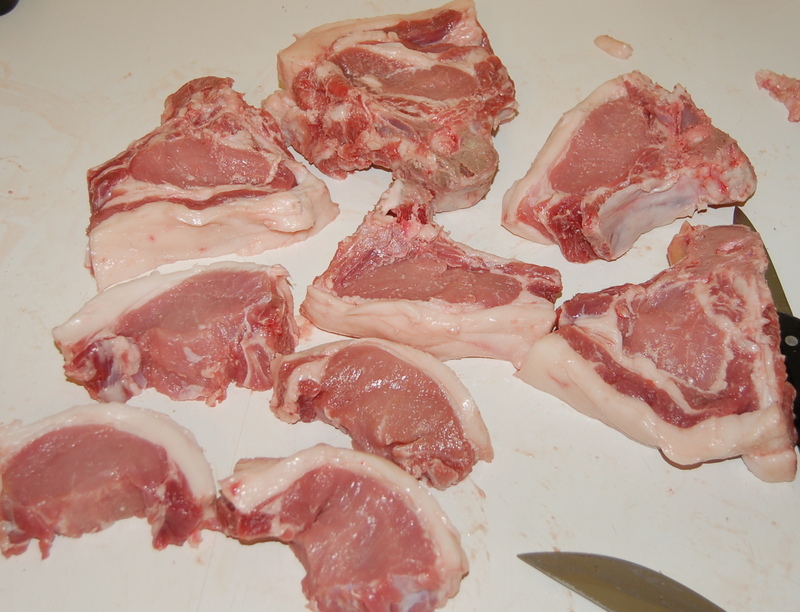 Some was very difficult to cut around the bone, so unfortunately I made boneless pork steaks. I would rather all bone-in chops, but I was getting frustrated so I decided to go the easy way. I could be wrong, but I also don’t think the butcher I got it from cut it on center, which may be part of my difficulty. It could also just be that I don’t know what I’m doing yet. I forgot to take a picture of the tenderloin. That came from this section of the pig before I cut it up. It was much smaller than I expected, but that could just be my lack of butcher knowledge. Or it could be that I did it right and it’s a small pig. The picture makes them look pretty good! The piece on the right I deboned and put for sausage. It was a pain getting the ribs out nicely, so I just figured that more sausage would be a good place for it. The big hunk of fat on the top left will also be for the sausage. I cut that off the top of the bacon piece. Finally, the one in the middle is for bacon! I cut it into three pieces and have it curing in the fridge for bacon. Lots of bacon. These are two of the three hunks from this half of the pig. They aren’t pretty, but the should be nice and tasty. I’ll share the details of what the pieces went to another day. I have had enough pig for one weekend. We had ordered a whole pig to roast, but didn’t get to roast it. 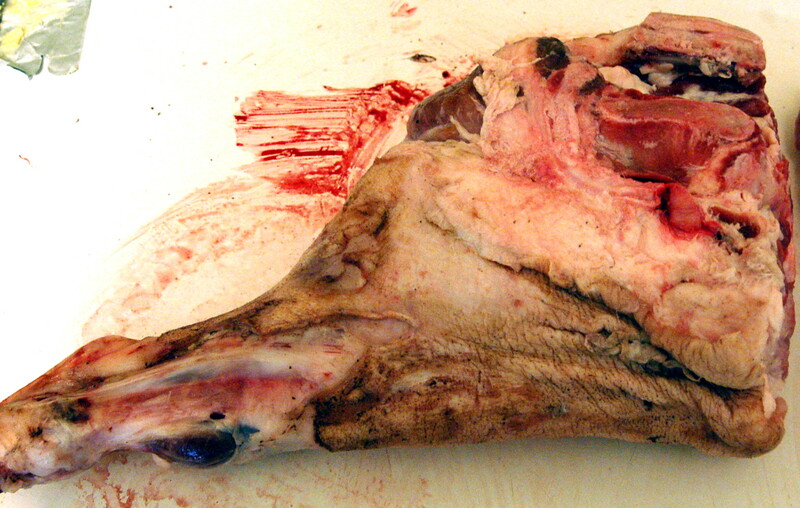 Now we have a whole pig that we needed to butcher and process ourselves, so I get to learn how to butcher. This is a skill we will eventually need to know anyways because I want to raise pigs. So, I spent some time watching videos and shopping for tools and then was pretty much forced to dive right in. We didn’t want the pig to go bad sitting around waiting to be processed, so no wasting time. Since there are so many different things that will need to be done with the pig, I decided to make it a whole weeks worth of posts. The first will be getting the primal cuts from the pig. Then the smaller cuts, making uncured not smoked bacon, canning pork, sausage making, wet cured ham, and maybe a stew (in no particular order). This is my first experience with butchering anything so I may be using incorrect terminology or doing things far from perfect, so if there are any pros out there please forgive me and feel free to offer constructive criticism. 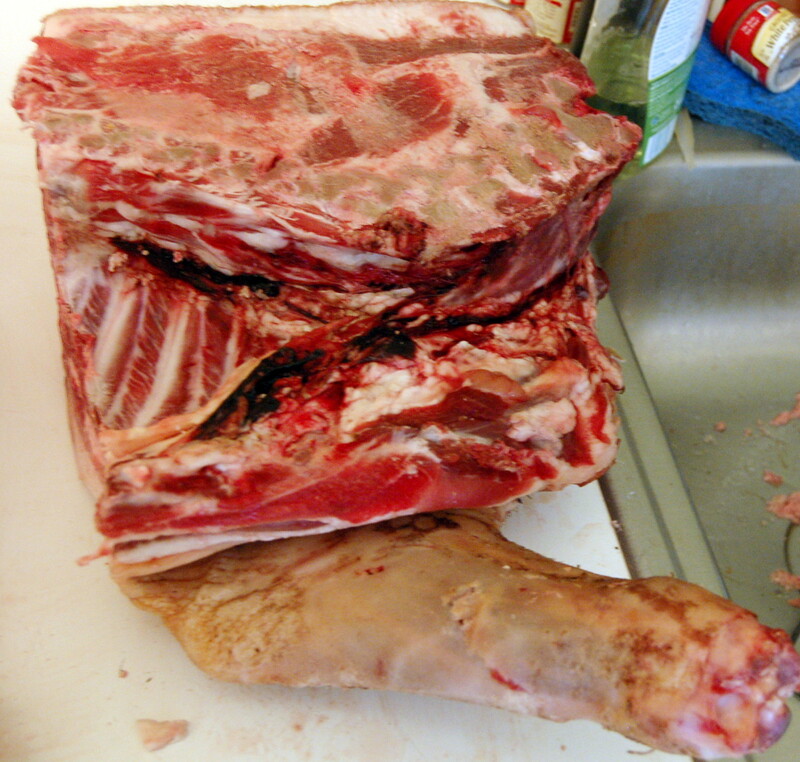 Here is a link to the video I mainly used to butcher the whole pig. 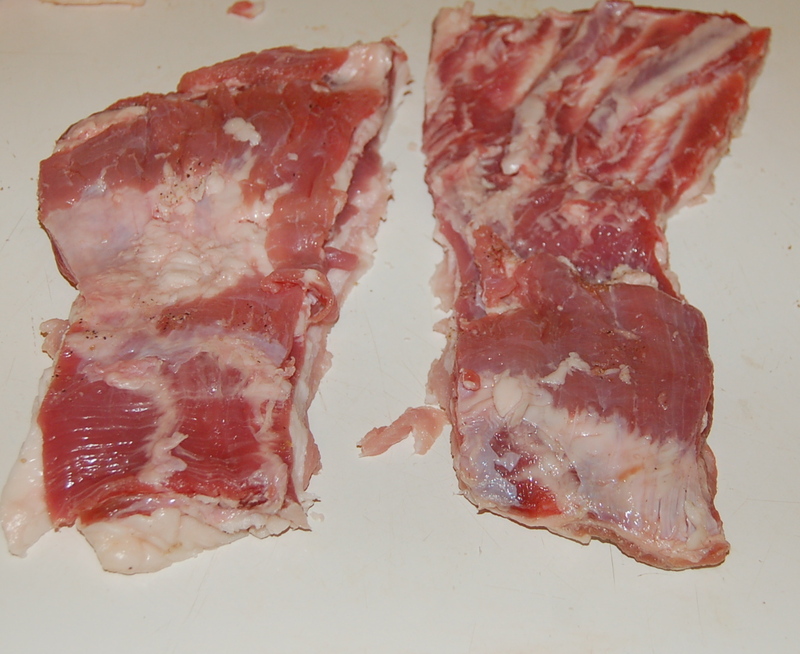 Here is a link to a great picture of the different cuts you get from the primals. Here is my understanding of the primal cuts: The cuts are the ham, loin, belly, and shoulder. I have found other examples of slightly different primal cuts, but this is what I’m working with. These are the main sections you cut the pig into to get it workable. Once you have the primals, you cut them into the pieces of meat that you will eventually use. In order to do this you need a big working surface, a hacksaw or butchers saw, a knife long enough for the big cuts (the one in the video looks almost like a machete to me), a small knife (like a paring knife I guess), and a butcher knife. I didn’t go with the butcher knife because I am not venturing into tying meat. Don’t forget a sharpening stone or something to keep your knives sharp. It makes life so much easier if your tools are sharp. Again, not a pro so forgive my terminology. I didn’t go into much detail on what exactly I did because I am not completely sure myself. For much better info, see the link I posted at the top. The hard part seems to be getting the skin off. I thought you were supposed to do that before you carved the pig up, but you aren’t. I got halfway through the first side and then realized that. You will have to take it off eventually, but not the whole thing at once. It is tough because you don’t want the fat to all come off with the skin. The fat gives the meat a lot of it’s flavor. You don’t need to eat the fat, but cook with it. Getting the cuts in the right spot was also a little tricky. Since the anatomy is different on each animal, you can’t just match up to a picture. I sure tried though! For our very first year out on our property we wanted to have a celebration. I planned a pig roast and of course had big ideas, but it won’t be quite what I was planning. Time, good weather and, of course, money ran a little shorter than I had hoped. I knew this would happen, as it always does, but I planned big anyways. It looks like we will end up having pork chops and chili, with pie of course. 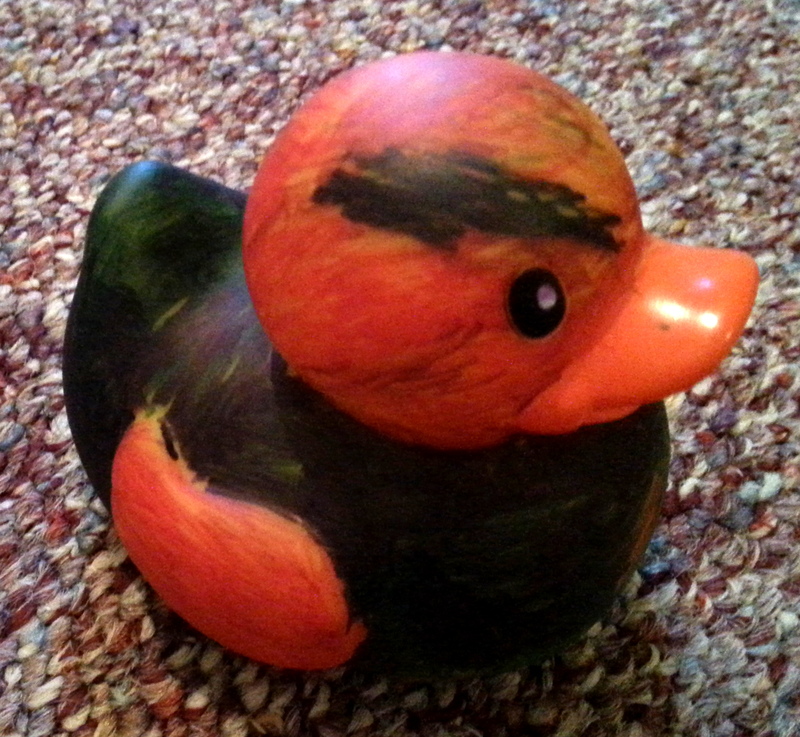 And we will have a rubber duck race in the stream. It won’t be as big as I was thinking, but we will have a great time anyways. We will have good friends out to help us get a couple “heavy lifting” jobs done. We will eat and maybe have some beers. We will celebrate the fact that we are out here. Being out here has been our plans for many years now and we are finally out here. That is surely something to celebrate. And having good friends to come celebrate with us is a reason to celebrate on its own. We have had a lot of support and well wishes from many people along the way and we are thankful for all of that. It may be a small and rustic celebration, but we have plenty to celebrate and that is all that matters. A mud kitchen has been our best entertainment so far. 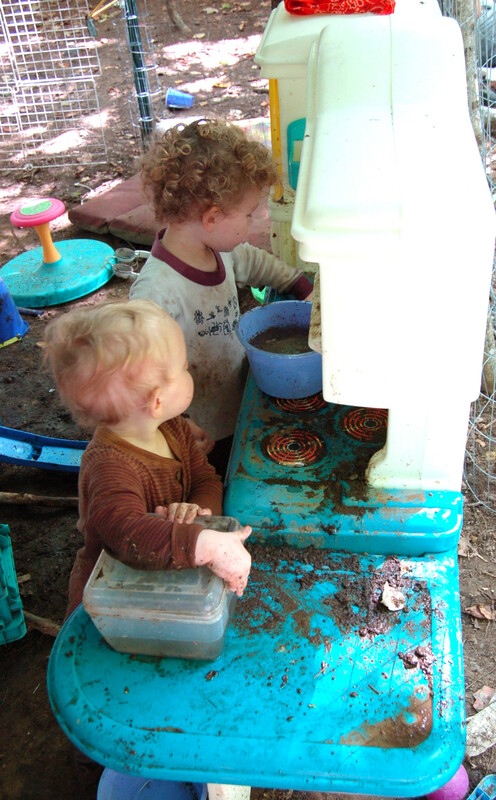 There is clearly dirt everywhere, add a little water, some utensils, and some pots and pans or buckets. 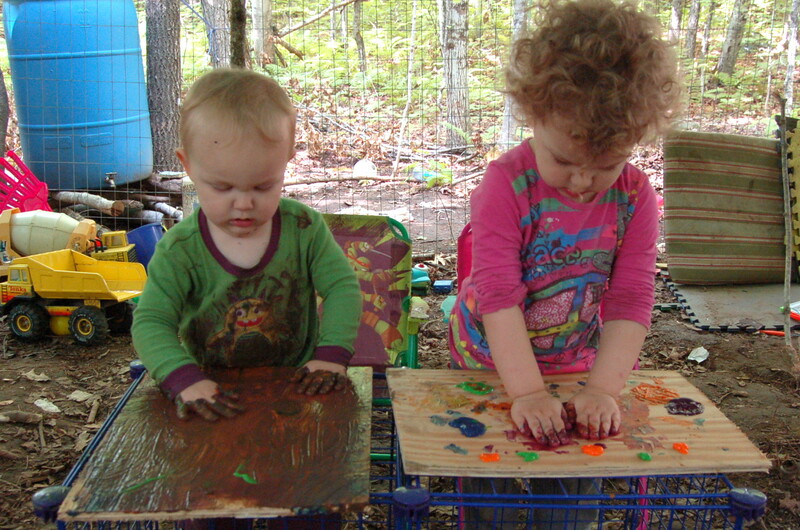 The kids have made many mud pies, nachos, macaroni and cheese, and anything else they could think of. Naturally they still haven’t mastered sharing, but they will get there. We got this kitchen for free from a friend. I gave them old pots and pans and things. I paid nothing for this set up except the gas to pick up the kitchen. 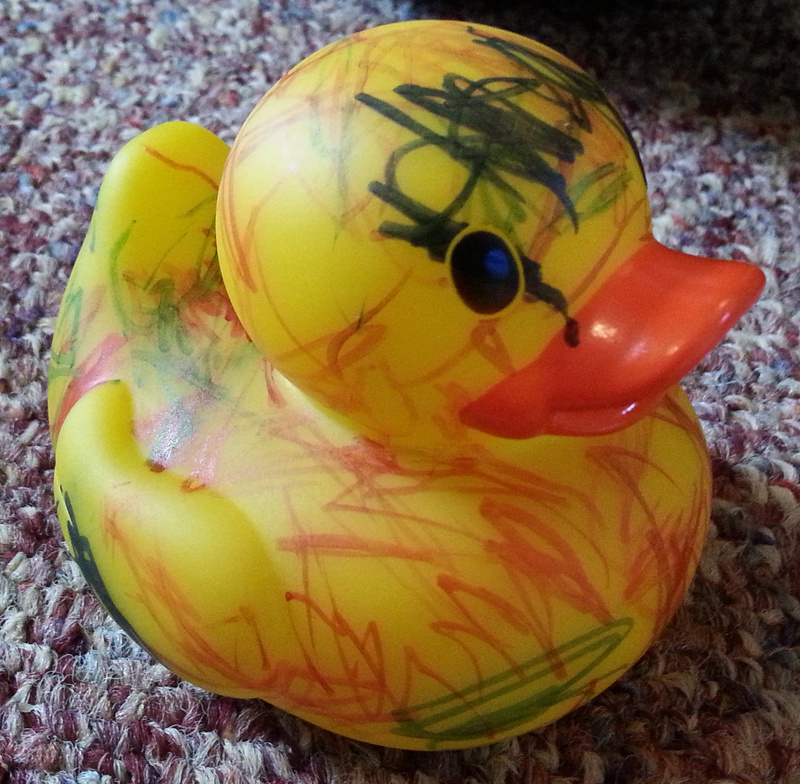 They were playing in the mud before the kitchen, but this greatly increased the entertainment factor. Remember: bring lots of extra clothes if there needs to be nap time or you want to attempt to have them clean to eat. It has been plenty warm, so it’s ok if they are soaked. This may not work so well once it gets cold, but for now, it’s great. 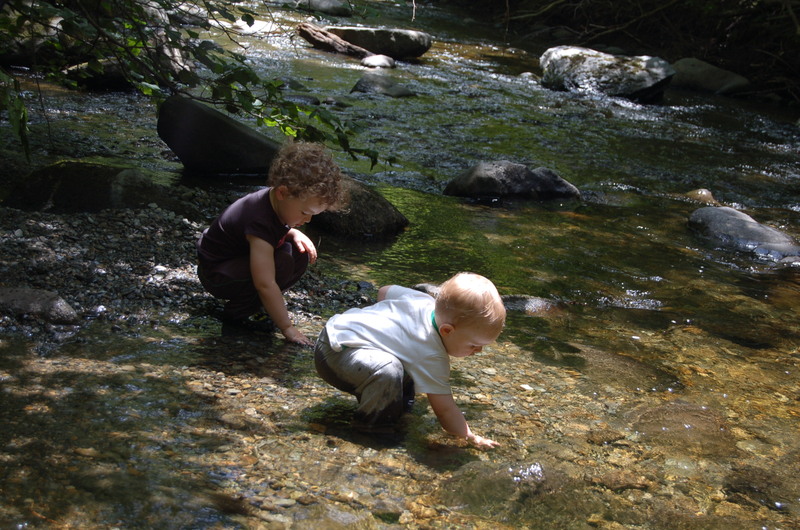 Throwing rocks in the water is another favorite pastime for our little ones. This usually means that productivity comes to a full stop because we both go down to the stream with them. When we are working near the stream and when they are older, we can still do something, but for now this is usually more of a break for us than something to occupy the kids. Looking at critters can be interesting, sometimes. The little boy sure enjoys it, but the little girls often runs away if the critter moves too fast for her. Snails are easy. 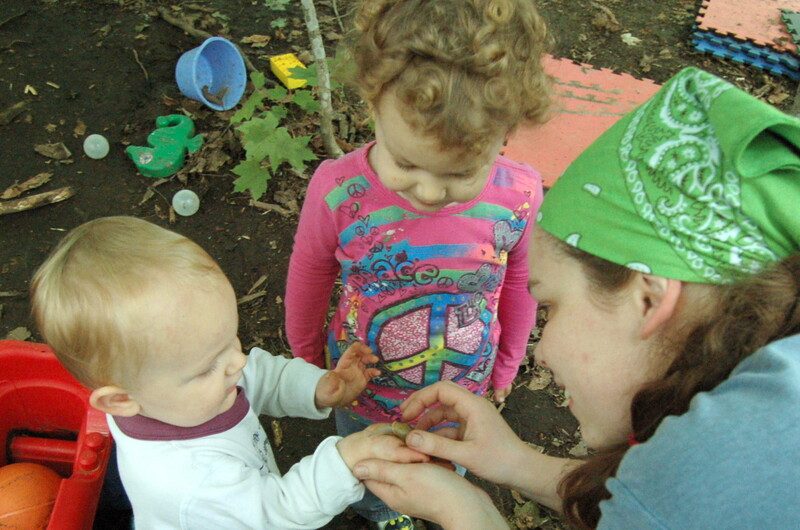 We have also showed them frogs, salamanders and any bugs we find around the place. The little girl tends to not go for the bugs. One of the many things to get used to being out in the woods is the quiet. Sure, we have neighbors and you can hear them sometimes, but not like in town. What we hear of our neighbors out in the woods is an occasional chainsaw or tractor, a car drive by, and cows mooing. Once night time comes there is nothing but quiet. Many days there is nothing but quiet. Quiet to the point that you hear every sound that nature has to make. Sounds you would never hear otherwise. Sometimes, it is so quiet that a small branch falls out of a tree 5 feet away and it scares the crap out of you. Not that this has happened to us, of course. It is definitely taking some getting used to on my part. I sit down as the sun is going down and it starts getting dark and I can’t really see much. Every little sound I hear I am wondering what it could be. I guess once I am used to being there in the dark I will get over that.